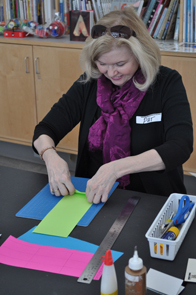 The Museum’s professional development programs are primarily for educators interested in engaging students in the visual arts and the art of the book. The programs emphasize teaching through the arts and encourage critical and creative thinking. Our goal is to help all educators, regardless of their familiarity with art, encourage their students to further develop visual and verbal literacy. Sign up for an upcoming workshop at The Carle. Book a program for your group at The Carle or your site. See a list of upcoming Professional Development Workshops, Programs and Events.